Fred had serious emotional problems after almost two years sailing. Where is my mommy? Where are my friends Axel and Martin? He kept repeating. But now after psychological treatment is in good shape, enjoying Cartagena, and ready to continue the journey. 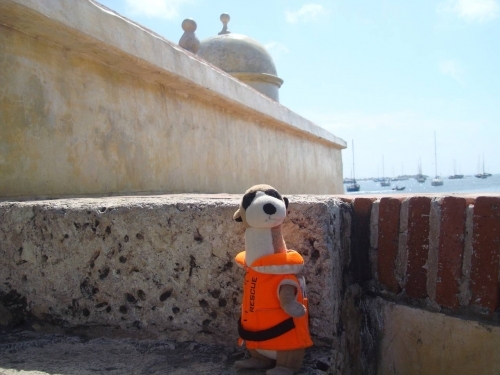 Now he is quite interested in the stories of pirates that surround Cartagena. At times he felt with the soul of a pirate. Meanwhile, his friend Captain Baez is waiting for the arrival of the ship that will take him to the Far East. The most probably vessel is MV BAHIA CASTILLO, Hamburg Sud Line. This vessel is arriving to Cartagena this week.